I'm feeling kind of old lately. This was yet another episode of Who Do You Think You Are? where I had not heard of the celebrity. After looking up her credits, I see why. She really doesn't have that many, and I don't watch the shows she's been on. But I did say the first season that WDYTYA was on TLC that the list of celebrities looked as though they were trying to skew to a younger audience, and that ain't me. The announcer said in the teaser said that Angie Harmon would learn about a relative who was bought and sold, and that her ancestor had something to do with a pivotal point in American history. Considering the dramatic delivery, at first I wondered if it might have something to do with the Civil War, but since there was no hint that Harmon was going to learn she had a black ancestor, and I really didn't think WDYTYA would spring that on everyone with no warning, I figured they used that phrasing just to throw us off. Harmon is shown in the opening segment with her three daughters. She tells them that she is going to learn about their ancestors. We are told that she is an acclaimed actress ([cough, cough] two awards over a "career" [such as it is] of twenty years do not an "acclaimed actress" make). She went from being a model to appearing in movies and on television. Her best known series are Law & Order and Rizzoli & Isles (which at least has Sasha Alexander, who used to be on NCIS; and speaking of NCIS, no, Angie Harmon does not appear to be related to Mark Harmon). She is an ambassador for UNICEF, particularly focusing on campaigns against child trafficking. Harmon lives in Charlotte, North Carolina with the aforementioned three daughters. At no time on the program is their father mentioned; apparently Harmon and her husband separated in 2014. Harmon herself is an only child, but her mother and father each have three siblings. She grew up knowing all her cousins, who were her age, so it was like having siblings of her own. Harmon grew up in Dallas, Texas. She was with her mother until she was 11, and then "switched over" (her phrase, not mine) to be with her father. She knows her mother is 100% Greek, but doesn't know as much about her father. She is convinced he has Irish or Scottish ancestry but has less actual information about his family. His parents were Henry Harmon and Velma Daugherty. And that's about all she knows. She also talks about how she is a very strong person and very resilient, and how she would like to know where in her family that comes from. Next we see Harmon walking with her daughters again. She says she hopes she finds some pictures of ancestors during her research and asks the girls if they think some pictures might look like her. Then she talks about how she loves family and is really interested in learning about her ancestry. Her father was a history teacher, and she loves history also. She wants to share the information she learns with her daughters, because it's their heritage too. The "research" begins with a letter from Harmon's father. She is at home with her daughters and reads the letter to them; she says it came from "Poppoo" (that's the closest I can come to approximating how she pronounced it; apparently it's what they call their grandfather). He said he was sending pictures of people she had never known and how dedication to family was part of her genetics. (Gee, I didn't know that was a genetic trait.) However many photos he actually sent, we get to see only one, of Harmon's grandparents, Henry Jefferson Harmon and Estella McGoldrick Harmon, with five children. When Harmon prompts the girls what Henry and Estella's relationship is to them, one correctly answers great-grandparents. When Harmon says she's going to a genealogist for help to learn more about the family, however, we hear a small voice in the background say, "Or a genie?" I think that's a great idea — can you imagine how much easier your research would be if you had a genie to help you find documents? Harmon begins the next stage of her learning experience by driving to the Charlotte Museum of History. On the way we hear that she had sent the information she had to genealogist Joseph Shumway (of Ancestry.com; I think it's at least his sixth appearance on the program? ), who will be meeting her at the museum. Shumway says that he took the information and used vital records, land records, newspapers, and other information to go back on the Harmon line. (It's nice to see the show acknowledging more of the records used in research, even if it's only a quick passing mention.) Now the ubiquitous computer appears, a little later than usual recently but already logged into Ancestry.com, and Shumway says he has put together a family tree. Harmon sounds genuinely enthusiastic and sincere when she says, "Thank you!" The initial shot of the tree, which shows Harmon and her parents, is not focused (living people, you know). Her father, however, is Larry Paul Harmon. His parents were Henry Harmon, Jr. (1914–1994) and Velma Evelyn Daugherty (1916–2012). Henry's parents were Henry Jefferson Harmon, Sr. (1882–1956) and Celia Estella McGoldrick (1878–1966). Harmon mouses over each, and we see more details: Henry Sr. was born June 20, 1882 in Missouri and died September 5, 1956 in Oklahoma; Estella was born December 11, 1878 in Missouri and died December 17, 1965 in Cushing, Payne County, Oklahoma. From there we go to the floating sky tree and travel back to Harmon's 5th-great-grandfather: Larry to Henry Jr. to Henry Sr. to James George Harmon to Thomas Jefferson Harmon (how patriotic!) to Peter Harmon to Michael Harmon. At Michael we return to the computer screen shot. The icon shows that Michael was born in 1754 but has no death year. As Harmon mouses over it, we see that he was born in Germany. This flabbergasts Harmon, who had no inkling she had any German ancestry. After Shumway tells her to click on the box for more details, the computer goes to a different view, which includes an entry that says Michael Harmon arrived in 1772 to Philadelphia. (If you look quickly, you can also see that Michael's son Peter lived 1782–1853.) Harmon notes Michael was about 18 years old when he arrived in Phillie. Harmon has never been to Philadelphia before. She goes to the Historical Society, where James Horn, Ph.D., of the Colonial Williamsburg Foundation greets her. (On the WDYTYA episode with Reba McEntire, we were told he specializes in indentured servitude as a research subject.) 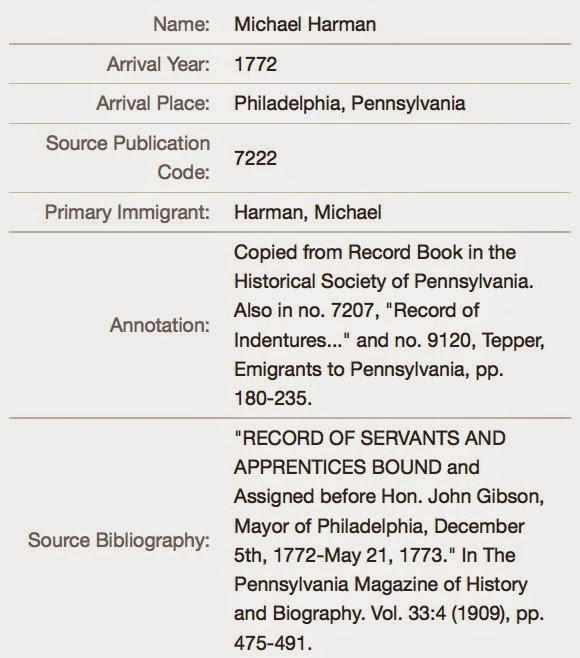 Horn has a book with records for apprentices and servants in the city of Philadelphia. Michal Harman appears in the index; when Harmon goes to the referenced page, the entry at the top of the page shows that he arrived December 23, 1772 and was contracted for 5 years and 7 months to William Will of Philadelphia, who paid £23..5 (23 pounds and probably 5 shillings) for his passage from Rotterdam. (After previously noticing Harman versus Harmon, she doesn't seem to note that his name is spelled Michal on this page.) They discuss how people didn't have to pay their fares up front but could contract to pay at their destinations. Those passengers were then hoping that a merchant, ship's captain, or someone else would pay when they arrived. Horn explains they were auctioned off to the highest bidders. 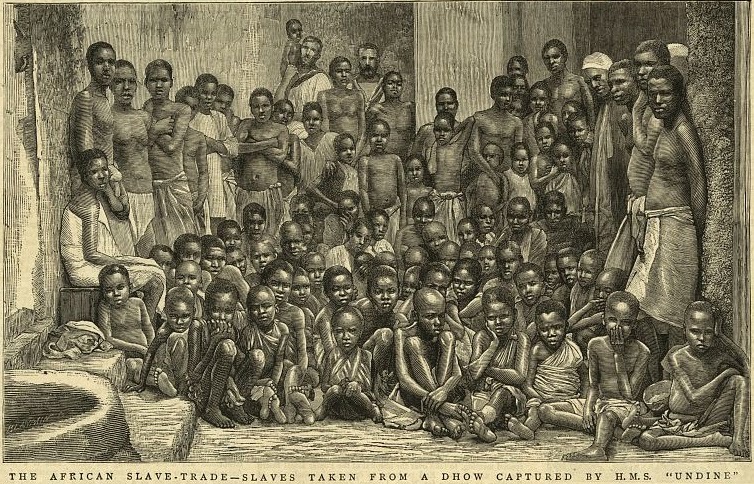 Indentured servitude was common in this period. The servant was bound by contract, had no say in the choice of bidder, and received no wages during the period of servitude. Horn adds that Michal would likely have known before he departed on the ship what he was getting himself into. Harmon wants to know why Michal would have left his home and asks what Germany was like at the time. The big problem for young men such as Michal was that little land was available. Horn says that land was the ultimate test of worth. This situation convinced many people, who often became indentured servants, to leave just for the opportunity to have land of their own. Doing some quick math in her head, Harmon figures out that Michal should have been finished with his contract in 1778. Horn agrees but points out that the American Revolution against the British was going on by that time. He asks Harmon what was going on in Philadelphia and where Michal was. She sounds concerned and asks him, "Do we know?" He responds, "That's what we've got to find out!" Going to Fold3.com, Horn explains that it is the online place for American military records (it's owned by Ancestry, of course, which he doesn't mention, but it is nice to see the show use a different Web site). He has Harmon enter Michael's name as "Harman" and says she should do so because that's how the name appeared on the records they've looked at (conveniently sidestepping the fact that the search on Fold3 is not very flexible; I still wonder why Ancestry doesn't port its more robust search pages over). Among the results is Michael's Revolutionary War service record. He served under John Lewis in the 4th Pennsylvania Regiment of Foot, an infantry unit. The account date on the card is January 20, 1778. Harmon is very proud that he fought on the American side. 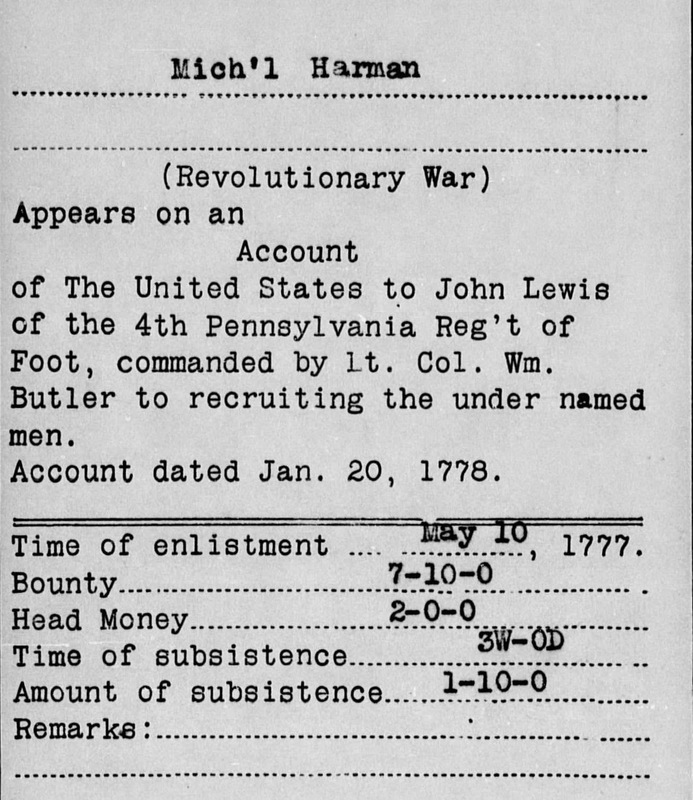 Michael enlisted on May 10, 1777 for three years, which was standard (plus he got a bounty!). Harmon notes that he was only 23 years old. Horn has to point out that 1877 was before the end of Michael's indenture period and says that Houts would have received compensation because of that. This causes Harmon to wonder if there was a draft or if Michael volunteered. Horn says it was the latter and that she should think about the risks Michael subjected himself to by being a soldier. When Harmon asks what happened to Michael after that, Horn says that he sent the documents to his colleague Scott Stephenson, an expert on the Revolutionary War, and that Stephenson "might be able" to tell her more about her ancestor. (Wow, that's pretty impressive! Harmon hasn't even left yet, and Horn has already sent the documents on to someone else. Oh, wait, you mean this was all found ahead of time? Like it's scripted or something?) Harmon effusively begins to thank Horn, then gives him a big hug. She seems very genuine in her enthusiasm (unlike Kelly Clarkson). In the outro to this segment, Harmon talks about how impressed she is with Michael and all the risks he took, beginning with coming here at only 18 years old. She apparently has a soft spot for troops and really appreciates that Michael volunteered to serve his new country. She also mentions that he went in wholeheartedly, but that's just her embroidering on the story, because we have no idea about that. For all we know, he could have hated his work as a tanner and thought it would be an improvement to be a soldier. Still in Philadelphia, Harmon now goes to the Free Library to speak with R. Scott Stephenson, Ph.D., director of collections and interpretation (I am so sorry they are using that word that way) at the Museum of the American Revolution. (He helped Valerie Bertinelli with Quaker research.) He says they can reconstruct a lot by using documents. He hands Harmon a (copy of) a voucher dated May 7, 1778 that says "camp near Valley Forge." Michael received $6; this was essentially a pay stub for his work in the army. Stephenson explained that pay in the Continental Army was intermittent and that this was actually back pay. Harmon looks on the voucher where it appears that Michael signed for his payment. Stephenson points out that it actually shows an X and says "his mark", indicating Michael was illiterate. For all of Harmon's professed interest in history, hearing "Valley Forge" didn't make much of an impression on her, so Stephenson has to be very heavy-handed to get the next point across, asking her, "Does Valley Forge mean anything to you?" She says she vaguely remembers studying it but could use a reminder. Stephenson tells her that in September 1777 the British captured Philadelphia, which was the capital of the newly minted United States. Congress fled Phillie entirely. Michael and the 4th Pennsylvania, along with the rest of the Continental Army, had to find a place to hole up for the quickly approaching winter. There was no city nearby, so on December 19, 1777, they created an encampment at Valley Forge, under the direct command of George Washington. This finally gets Harmon's attention, as it slowly dawns on her that her ancestor was in the same place as the father of our country. Suddenly she is excited, and she says her father will love to hear about it. Stephenson says that Valley Forge is only about 30 miles away from Philadelphia and asks if she wants to visit. Now that she understands its significance, she happily says yes. Stephenson and Harmon drive to Valley Forge National Historical Park. Stephenson explains that the cabins in the park are reconstructions of those that the soldiers, including Michael, used for shelter during their winter encampment. Each "hut" would have housed twelve men. Harmon says, "It's amazing," and I realized she had been saying that several times during the episode, to the point it had become meaningless (but I restrained myself from watching again to count the number of times). When Stephenson and Harmon go into one of the cabins, Harmon discovers that it's pretty cold inside; Stephenson tells her that the buildings were not windtight or sealed from the rain because the men had to make do with minimal tools and no nails to put them together. So while the British were in reasonably comfortable brick buildings in Philadelphia, 2,000 of these cabins housed the Continental Army at Valley Forge. During the winter of 1777–1778, they suffered through shortages of food, clothing, and other supplies, because the Continental Congress was in chaos and couldn't help them. 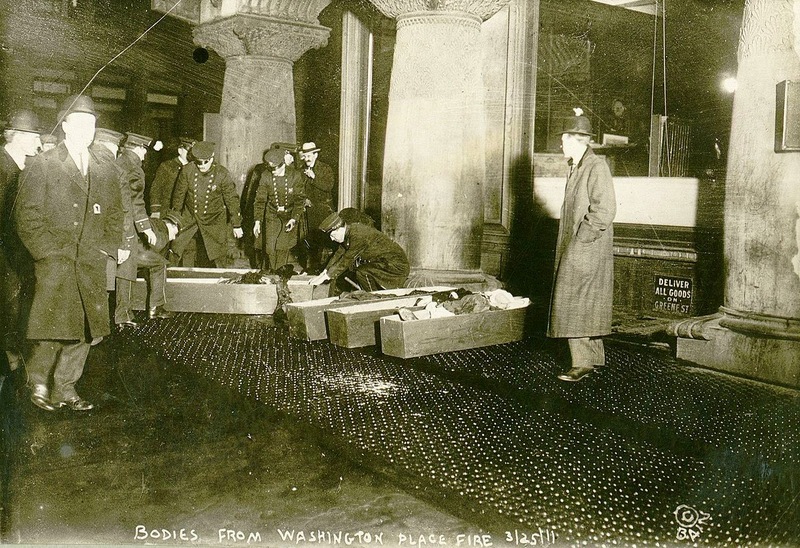 Men caught pneumonia, typhoid, and other diseases, and about 2,500 men died there. But Michael survived, and Harmon is elated to think that she could be walking on the same ground where he had stepped. Stephenson talks about how these men were fighting for a country with power resting in the people, not a king, which was a radical idea at the time. When Harmon asks whether Michael would have understood the historical significance of what he was taking part in, Stephenson tells her that Washington often told the men that "the fate of millions unborn" depended on what they were doing. Unless Michael still hadn't learned any English, he probably had some idea. And what happened to Michael after Valley Forge? Stephenson says that most records are in the Pennsylvania State Archives in Harrisburg, and there should be more documents about Michael. As she leaves Valley Forge, Harmon says how impressed she is with Michael and the strength he had in his heart (um, and where did she learn about that?). He persevered through horrible conditions and was a remarkable man. (Well, he did persevere, I'll give her that.) Obviously, her resilience must have come from him (and now we're back to that theme). Next up is a visit to Harrisburg and the Pennsylvania State Archives, of course. As Harmon approaches the entrance, she is greeted by Major Sean Sculley, listed as an assistant professor of history at West Point (and boy, does he have a bunch of ribbons on his uniform!). Information about Michael had been sent to Major Sculley, and as expected he had found more to share with Harmon. First is a letter to George Washington from January 2, 1781, letting him know that the 4th Pennsylvania, the regiment Michael was in, had committed mutiny. The unit's captain had been mortally wounded. This sends Harmon into a tizzy — how could Michael do this?! 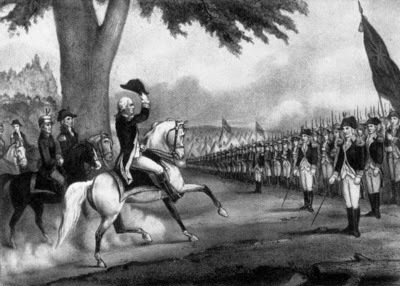 Major Sculley explains that the sergeants, corporals, and privates in the regiment had mutinied against General Anthony Wayne (apparently known by the nickname of "Mad Anthony"). The men then planned to march to Philadelphia to ask (ok, maybe demand) that Congress give them what they believed they were owed. Michael and the other men had served for up to three years, or more, with hardly any food and little pay. As far as they were concerned, Congress had committed a breach of contract. Men whose enlistment periods had expired were not allowed to leave. Harmon starts to get all worked up. She goes on about how sad the situation was, that the men couldn't get food or clothes, and really gets a head of steam up. Major Sculley interrupts her to point out that now she's beginning to understand how the men felt at the time. Harmon responds that they had been honorable men (which she really doesn't know; I'm sure not all of them were), and the mutiny was going to be connected to all of their names. Major Sculley points out that it was actually worse than that — mutiny was a capital offense, so they were risking hanging or a firing squad. 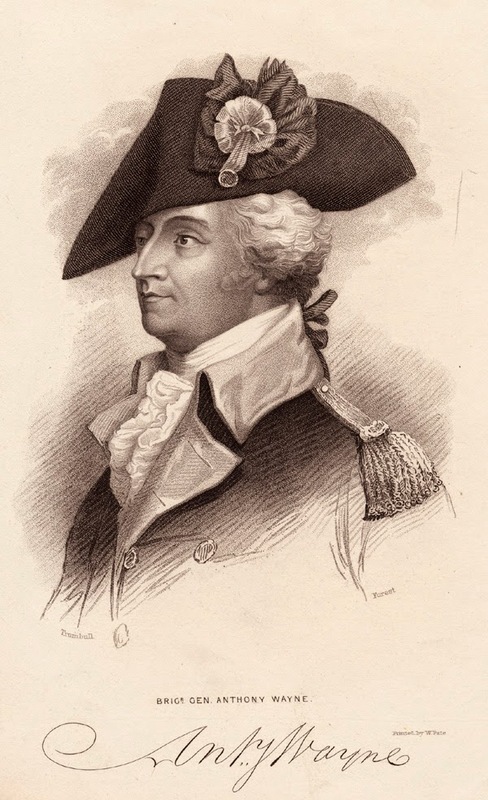 Major Sculley adds that Wayne was not really worried about the men going to Philadelphia, but rather that they would head to New York to join up with the British. He shows her another letter, this one from the British to the Pennsylvania Line. The British had offered to provide the men food, clothes, and the back pay that they were owed. All the men had to do was turn their backs on the upstart rebels and return to the British side. Under the circumstances at the time, this was a hard offer to pass up — but they did. When two British spies arrived at the camp with the letter, sergeants involved with the mutiny arrested them and took them to General Wayne. Hey, there's some hope after all! Wayne was able to negotiate with the 76th and 77th (but where does the 4th fit into that? ): Men could be discharged and then re-enlist with a new bounty, or simply be discharged and head home. So which did Michael choose? Major Sculley has a book from the Pennsylvania archives. I didn't see the title, but it has a list of NCO's. Michael's period of service is given as May 5, 1777–1781, so he opted out. Harmon figures out that when he was discharged, he was about 27 years old. And where did he go after that? Major Sculley says that Michael's son Peter was in Mercer County, Kentucky (though I didn't get how he determined that), so he had looked at tax lists for Mercer County. Michael appears on the 1795 list with 130 acres of land, so he actually got land, nominally the reason that he might have left Germany. Harmon comments that Michael was about 41 at the time of the tax list. As Harmon leaves, she admits that her heart had sunk when she heard about the mutiny, but she understands why the men were driven to do it. But Michael had a strong will and strong convictions (again, where did she learn that? did I miss that scene? ), and he had been denied what had been promised to him. Then she brings it back to herself (really, is it always about her? ): Why does she have such a need for justice? Where could it have come from? Now she knows that she got it from Michael! (Sure, uh-huh.) She gets over herself for a moment and wonders what she will learn about Michael's life in Kentucky. She asks whether he was married — probably, because we've already heard that he had a son — and how many children he might have had (still looking for that big family). Preston tells Harmon she has one more treat coming: She can go to the site where Michael lived. Preston has contacted the present owner and asked for permission for Harmon to visit, and the owner said yes. "Is that something you would like to do?" Of course she would! I actually did like what Harmon said next: "I would love to take my daughters." Now that's a way to try to get the younger generation interested in genealogy and history. Leaving Harrodsburg, Harmon talks about Michael's bravery and courage (which she couldn't possibly know about, unless one of those researchers showed her some kind of commendation that we didn't get to see on air, but she's bound and determined to make Michael bigger than life) and what an exceptional man he was. She is excited and nervous to see the land he had owned, and is happy that the girls are coming. They are met by a pleasant-looking man, who introduces himself as Michael Harmon (the name was passed down!) and says they are fifth cousins once removed. Harmon introduces her daughters, who have very modern names for girls: Finley, Avery, and Emery (please forgive any misspellings on my part). This Michael says that the land is still owned by Harmons 220 years later, which even I think is great. He tells Harmon that they can see the whole farm from a higher spot and drives the car up there. He points out that the distant treeline is the boundary to the property; all the land, cows, and everything else to that point is the family farm. The girls start running around and playing, and Harmon gets philosophical. All the fighting, suffering, and hardships Michael (the ancestor) went through were for this. He had a beautiful life and was able to pass that down to herself and the generations to come after her. Being here with her girls has made the journey complete, and now she feels whole. This has given her a new light for the rest of her life and will affect everything she will do, and she is so thankful she was able to experience all of this. I was kind of surprised at this emotional outpouring, but learning about her ancestor definitely seems to have affected her. Personally, I think it's more than a bit of a stretch to think she "inherited" all the traits she went on about, but if it makes her happy to think Michael Harmon passed that down to her, who am I to burst her bubble? Something I was struck by was how Harmon kept track throughout the episode of about how old Michael was at each event in his life she learned about. I don't understand why it was so significant to her, but she was pretty consistent about it. The only time I didn't hear her figure out his age was when she was looking at the will, which seemed counterintuitive. After all, that was around the time he died, an age more people tend to be interested in. Something else I noticed was that even though Harmon did find her big family, she didn't get the other tidbits we heard about in the beginning: She didn't find any paintings or other pictures of her ancestors (no photos, as Michael died about 1807, before the age of photography), and even though she was "convinced" her father had Irish or Scottish ancestry, we didn't hear about that again. Usually when the celeb talks about something like that, we see it later on. Could the producers be deliberately giving us false leads so we don't automatically know what to expect in an episode? I saw that same Ancestry.com advertisement where the actress says she found her grandfather's World War I draft card but what's shown is a card for World War II. I'm beginning to consider the possibility that the reason it isn't being changed is the same as why we don't see quality control in the databases on the Web site: It isn't costing them any business to air such an egregious mistake, so why spend money to fix it? Now that we're in the third season of WDYTYA on TLC, I am beginning to see a little bit of a "formula" for the celebrities chosen. First is the apparent marketing to a younger demographic, with actors generally more relevant to that group. While on NBC each season had at least one black and one Jewish celebrity, on TLC each season has had at least one gay celebrity. We still have somewhat of a nod to having a Jewish celebrity — Chelsea Handler (first season) is half Jewish; Josh Groban's father grew up Jewish but converted for marriage. Previously we have had only white Western European celebrities, but this season has Julie Chen and America Ferrera. It'll be interesting to see what happens going forward. And I actually had finished writing this before tonight's episode with Sean Hayes, but I wasn't able to post it before the episode started! Tina Sansone, whom I know from the Council for Advancement of Forensic Genealogy and its Forensic Genealogy Institute, and her colleague Sheri Savory cohost an Internet radio talk show called A Savory Spotlight. They interview guests from a variety of backgrounds — travel, DNA analysis, entertainment — including genealogy. Tina invited me last year to be a guest on the show, and we finally synched our schedules for March 24. It was a lot of fun! 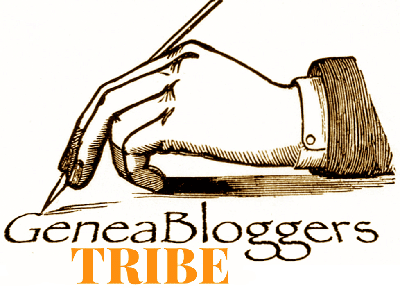 Tina and Sheri are very gracious hosts, and I was able to do something I enjoy a lot — share my enthusiasm for the work I do as a professional genealogist. • A synopsis of the March 24 program and links to listen online or download the audio file are here. • The Podcast version of the broadcast is here. • And if you use the Stitcher app, the link you want to use is here. My segment runs from about 22:10 to 42:18. A Savory Spotlight airs regularly on LA Talk Radio on Tuesdays at 10:00 a.m. Pacific time. Tina and Sheri have guests representing a wide range of interests. Some recent guests were from the Museum of Danish America, LeafSeeker.com, a high school competitive robotics team from Mississippi, and a running team participating in the Los Angeles Marathon. If you are interested in being on A Savory Spotlight, Tina and Sheri will be happy to talk to you. Information about the program and how to contact them is on the Web site for A Savory Spotlight. Then I'll be able to listen to you! It seems like I'm always running behind lately. I was desperately trying to finish my write-up about last week's episode of Who Do You Think You Are? just hours before this week's was set to air. I obviously was not able to make it this time. This episode was about Josh Groban (another celebrity I had not heard of!). The teasers said we would be researching his mother's side of the family and going to 17th-century Germany, there to witness brilliance and the torment of prediction. Groban is a multiplatinum singer, songwriter, actor, and record producer. He graduated from the Los Angeles County High School for the Arts. He has sold more than 25 million records and has been nominated for numerous awards. He started his own charity, Find Your Light, to bring music, the arts, and cultural awareness to school children. Groban was born and grew up in Los Angeles. He lives in Los Angeles just a few miles from the home he grew up in. To start his research, he goes to visit his parents, Jack and Melinda (Lindy) Groban; he has a brother, Christopher, who does not appear in the episode. Groban says that both of his parents are intelligent and that they took their sons to music performances. His mother was (is?) an art teacher, and education was always important in the family. 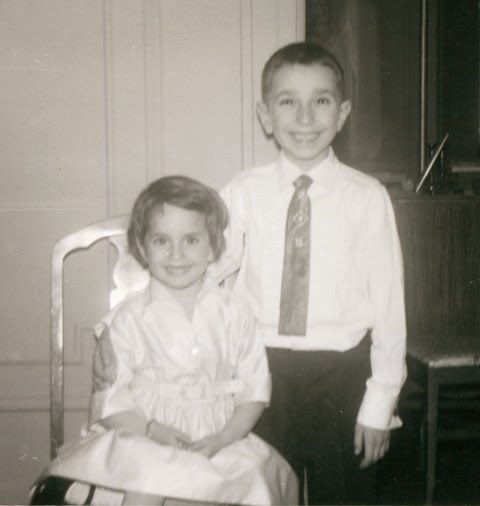 From a family history perspective, both of Groban's parents were only children, so he didn't grow up with any aunts, uncles, or cousins, and family trees never came up in conversation. That said, someone apparently has done research on his father's side of the family, because he says it has been documented. No research has been done on his mother's side, however. He knows that his mother was born in Los Angeles and that his grandmother lived in L.A. for many years. His maternal grandfather, Grandpa Lee, died before Josh turned 1. He is curious because he doesn't really know much about him. Lindy (Melinda) says that her father was one of five children. The Great Depression had a big impact on the family, and her father had to quit school to go to work to help support the family. Her father's father died when she was very young, and doesn't know much about the Johnston history. Groban says that he is doing this research mostly for his mother. He would like to find out when and why the relatives on her side came to the U.S. The research will be a gift for the whole family but especially for his mom. Groban begins his fact-finding mission by heading to the main branch (downtown) of the Los Angeles Public Library, where he meets professional genealogist Kyle Betit (pronounced "Beatty"; we have seen him previously on WDYTYA, on the Trisha Yearwood episode, where he was able to show off his French research specialization). He had asked Betit to research his mother's father's side of the family "as far back as possible" (oh, I love requests like that!). Betit explains that he used wills, deeds, newspapers, and other records to help create the tree that he obligingly has posted on Ancestry.com. What struck me immediately was that Groban's mother is listed on the tree with her married, nor her maiden, name, which is something you should never do. I also noticed that Groban was squinting at the screen. He went back and forth during the episode between wearing glasses and not, and when he didn't, he squinted. Vanity, thy name is Josh Groban! Betit clicks on great-grandpa Merrill Willis Johnson for more details. He was born July 6, 1882 in Algona, Kossuth County, Iowa and died August 30, 1954 in Oakland, Alameda County, California. Moving up the tree, his parents were George M. (maybe Merrill?) Johnson (1844–1899) and Mary Ann Zimmerman (1845–1914). Betit clicks on Mary Ann, and we see that she was born in January 1845 in Cass County, Iowa and died in Algona, Kossuth County. After showing Mary Ann's details, we jump from Ancestry.com to the floating family tree in the sky. On this tree, Grandpa Lee was Leander Merrill (two "L"s) Johnston, instead of Merril L. We then fly through several generations: Mary Ann's father was John Zimmerman; his father was Samuel Zimmerman; his father was another John Zimmerman; his father was Jacob Zimmerman; and his father was Jacob Christopher Zimmerman, Groban's 7th-great-grandfather. Jacob Christopher is shown as being born before 1694 and dying in 1759 in Philadelphia County, Pennsylvania. 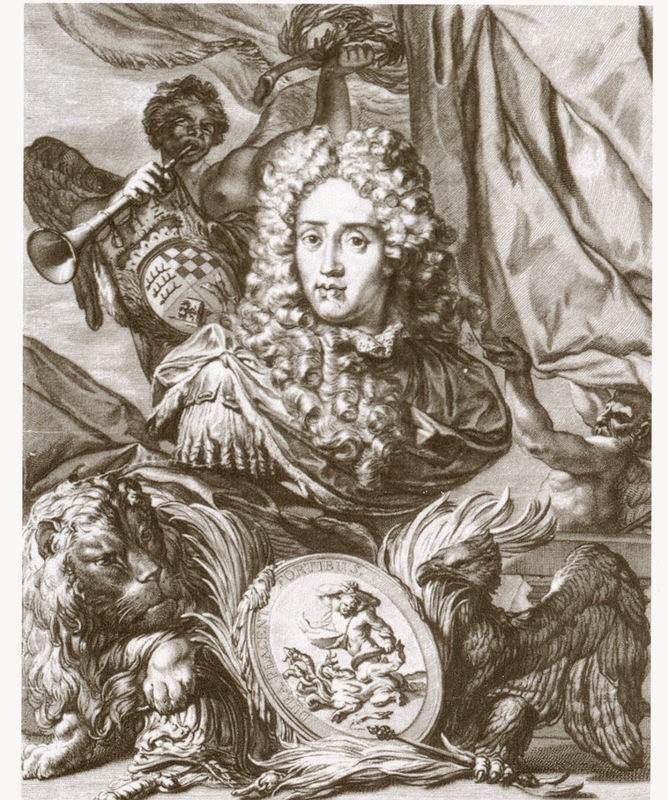 He was married to Sibilla Van Fossen (1691–1745). When we arrive at Jacob Christopher Zimmerman, Groban jokes that he was the "original Jay Z." Groban asks if there's more, and Betit shows him an index entry on Ancestry.com that has Jacob Christoph Zimmerman arriving in Pennsylvania in 1694 (which actually means he was born before 1695, because without more information, he could have been born in 1694 and been a babe in arms). The entry says that he arrived with the primary immigrant Maria Margaretha Zimmerman. Groban wants to know what that means, and Betit explains that Maria Margaretha was the main passenger and that Jacob Christoph was traveling with her. Some discussion ensues about how Maria Margaretha was probably Jacob Christoph's mother, making her Groban's 8th-great-grandmother. Groban wants to know where her husband is: Did he take a hike? Did he die? Were they divorced? Betit points out that what is displayed on the screen is only a transcription. To learn more, they need to go to the source of the information, which is the book William Penn and the Dutch Quaker Migration to Pennsylvania. Groban wonders why they would have gone to Pennsylvania, and Betit explains that people of many religions were going there because it was a haven for freedom of religion. Groban wonders whether Zimmerman would have been German or Dutch. Betit conveniently has a copy of the book at hand and has Groban look up Maria Margaretha. The Ancestry.com reference is for page 409. (Betit does not mention that the book is also only transcriptions.) The entry for Maria Margaretha shows she came from Bietigheim (east of Pforzheim), Würtemberg [sic], now part of Germany. (Betit is surprised that Groban pronounces Bietigheim correctly.) She was the widow of John Jacob Zimmerman (Groban's 8th-great-grandfather) and came with four children. John Jacob died in or after leaving Rotterdamn, en route to Pennsylvania. But they couldn't show the first section this early in the episode, because it would have given away some of our "surprises" later. Now, of course, Groban wants to know how John Jacob died. He also asks why Zimmerman would have wanted to leave Württemberg and go to North America. Betit tells him he'll need to look in Germany and says the best archive is in Stuttgart, the capital of Württemberg. From this point on, the episode is focused on this one ancestor and his story. In the outro to this segment, Groban says that something is telling him that Zimmerman must have had a desperate need to make his journey. Unless he's psychic, I don't know how he could have gotten that from the information Betit provided him. But since WDYTYA is always heavy on foreshadowing, we can take that as a sledgehammer hint that not everything goes well for John Jacob. Rückert kindly provides a translation of the entry, which says that on February 22, 1671, "Mister M. Johan Jacob Zimmerman, Deacon at Bietigheim, legitimate son of M. Mattheus Zimmerman, citizen and hospital cooper at Vaihingen on the Enz, married Maria Margaretha, legitimate and left behind daughter of Mister M. Philipp Henrich Schaal, late faithful Deacon here." (I'm guessing that "left behind" is a poor, literal translation that should have been "surviving.") Groban asks what religion this is for, which Rücker says is Lutheran. Groban then latches onto the word Deacon, totally ignoring the fact that the entry also identifies his 8th-great-grandfmother's maiden name and the name of his 9th-great-grandfather on that line. (Maybe he did ask about it but it ended up on the cutting-room floor.) Rückert says that a deacon handled marriages, burials, and baptisms in the church. He also explains that a hospital cooper was a craftsman who worked at the hospital (pretty vague, I know), and that Mattheus' father and grandfather probably also did the same kind of work. The abbreviated title of "M." stands for Magister or Master, indicating that someone had a university degree. (But does that mean Mattheus had a university degree, since his name was styled the same way in the translation? If so, why was he still a hospital cooper? Or was this another translation error?) Johan Jacob studied Lutheran theology for his degree. Johan Jacob studied at the university in Tübingen, Württemberg, for eight years. Usually four years would be enough, but he apparently was a great thinker and believer. 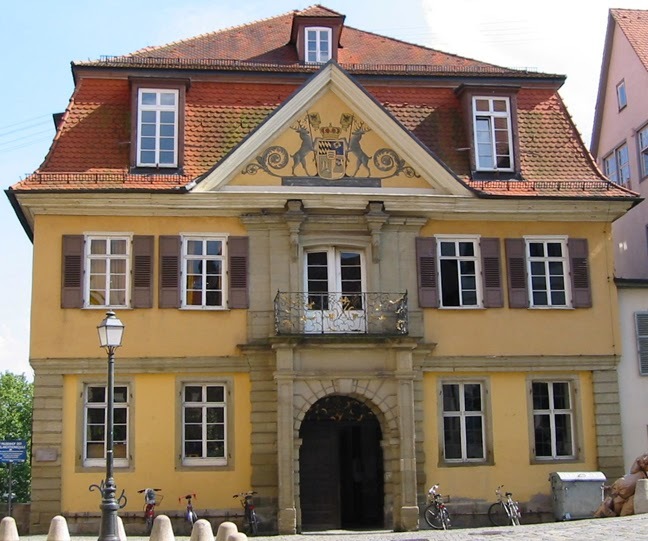 Rückert says that if Groban is interested in learning more about his ancestor's education, he can go to Tübingen, as the university is still there and has lots of great records. And on we go to Tübingen. Groban walks through the town and to the university, where he finds head archivist Beate Martin. She points out that one of the buildings is a student dormitory where Johan Jacob lived while he was there. They then go to the archives, which look cramped and which Groban calls very "cozy." Martin says that the archive has documents for all the students who studied there. She has a book for 1624–1748 which has a bookmark on a page with candidates for Master in 1664. Johan Jacob is second on the list, which she explains was his ranking in the class. Groban asks what he studied besides theology. Martin has a document that is essentially Zimmerman's "report card" from 1668. He had been a math and music instructor, in fact the only music instructor. The report says he "supervises music with care", which Groban says gives him chills, and "not just because it's cold down here." Martin then shows Groban a book she says that Zimmerman used for teaching music. Groban revels in the fact that he is holding a book that his ancestor actually held. He flips through pages showing music theory and some practice pieces. (Wow, 17th-century music theory!) Groban is excited that his ancestor was passionate about music, as he is. Martin also shows Groban a copy of Newton's Principia, in which Newton mentioned Zimmerman. Zimmerman witnessed a comet on Novemeber 23, apparently in 1680. Since Zimmerman seems to have spent quite a bit of time studying the stars, Groban wonders how he managed to do that and have time to be a deacon. Martin says he can visit the church in Bietigheim to find out more. (I've commented before that WDYTYA reminds me of those computer games where you have to find one piece at a time before you are led to the next . . . .) Groban wonders why someone who seemed to have everything going for him would want to leave and says that something must have happened. And so we finally head to Bietigheim, where we have already heard the Zimmerman family was living before they began their journey to Pennsylvania. Dr. Jonathan Clark, a historian at Concordia College, meets Groban at the church where Zimmerman was a deacon. Groban says he has asked Clark to research Zimmerman's work at the church. Groban starts here by asking why Zimmerman would go to America when he was so involved in his studies and being a deacon. Clark shows Groban a document from January 28, 1678 with Zimmerman's signature. The translation shows that the document is a letter addressed to the Duke of Württemberg, imploring the Duke not to transfer Zimmerman elsewhere but to spare his family; his wife was pregnant at the time. Clark explains that the cause of the tension was that Zimmerman had rubbed his pastor the wrong way and had previously been warned. Clark then shows Groban a book, Neue Comet Stern, from 1682. Zimmerman saw Halley's Comet in 1682 and was profoundly affected by it, and wrote the book. He believed the comet foretold future calamaties on Earth. Some of what Zimmerman wrote in the book was that something would destroy the churches and that it would be the "fault of the ordinary ministry." Zimmerman was part of a movement called Radical Pietism, which emphasized a personal relationship with God and a belief that the church was unnecessary and corrupt. This was obviously not looked on kindly by the established church. Zimmerman prophecied that 1693 would be a year of real change. He apparently believed that the stars had revealed that date to him. Historically it was not uncommon for people to believe that astronomical events could foretell tragedy. A comet in 1618 was believed to have presaged war in Germany. Zimmerman would have made his astronomical observations from the steeple in the church the two men are standing in. Groban quite reasonably wants to know how Zimmerman could have maintained his decorum in church if his beliefs had become so radically different, and what would have happened if these heretical materials had been found in his possession. Clark says he should go to the Evangelical Lutheran Church archives in Württemberg to see what records might exist. Groban has had an extraordinary experience being in the church where his ancestor worked. He goes up to the steeple to see the sky as Zimmerman would have. He wonders if Zimmerman's heresy is the reason the family left Württemberg. Maybe they had feared for their lives if they stayed. 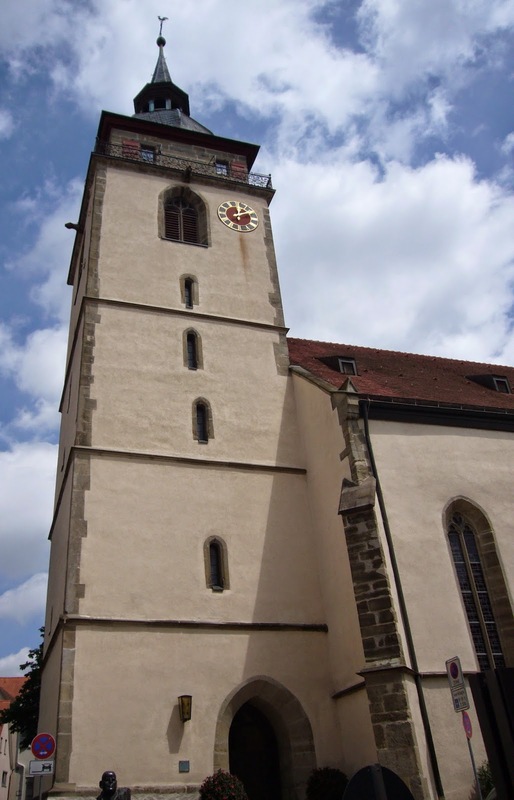 Groban now goes to Stuttgart, where the archives of the Evangelical Lutheran Church in Württemberg are housed. He heads to the central library (Zentral Bibliotek), where he is met by Jan Stievermann, a church historian at Heidelberg University. Groban asks why Zimmerman would have begged the Duke for permission to stay if he no longer liked the church. The answer is simple: He had a family to support. Stievermann has records from the Württemberg consistory, the ruling body of the state church. If something official had happened to Zimmerman, it would be in those records. It's possible he could have been called in and interrogated about his beliefs. The book Stievermann has contains minutes from consistory meetings for 1680-–1688. On page 577 the name of Johan Jacob Zimmerman of Bietigheim appears, from an action in 1684. He had been discovered. Even though he had published his book under a pseudonym, Stievermann asks, "How many troublesome theologians with astronomical training were in Württemberg?" I guess it didn't take long for them to figure it out. After Zimmerman was summoned, he confessed that he had written the book. He pled that his conscience should not be constrained and said that he would quit rather than recant his words. He believed that all European state churches were so corrupt that they would fall when the judgment of God came. He was unequivocally a radical, which Stievermann says meant he could be expelled from the state. Interestingly, the researchers lost track of Zimmerman in Württemberg after this. (I guess that means he left before the church kicked him out?) They don't know where he was; he just seems to have disappeared for several years. The next mention of him was found in a letter from the St. Petersburg archives. The letter was written by Zimmerman and was dated February 1688. He was writing from Frankfort, but it was not stated which one. He had been relying on his Pietist connections. One child had died, and he was in debt. He "recommend[ed] everything to the divine power." (No explanation was given as to how the letter ended up in St. Petersburg, which I was really curious about. Stievermann also didn't say to whom the letter was written.) He was really hoping his beliefs would carry him through. Groban asks if there would have been a community to help him. Stievermann explains that other Pietists would have helped as much as possible. They gathered in private homes, outside church authority. Everything would have been very clandestine. The last item after the letter from Zimmerman was one from a pastor in Hamburg, who wrote that Zimmerman had died in September 1693 and was buried in Rotterdam, where the family had gone to board a ship to Pennsylvania, but there is no information about how he died. So Zimmerman actually died the year he had predicted would be a year of change; he just hadn't realized exactly what the change would be. Other people hadn't wanted him to leave, but Pennsylvania would have acted as a magnet, as it was a safe haven for people with different faiths and unusual convictions. The translation of the pastor's letter ends, "May God have mercy on his widow and children." Groban is fascinated by what he has learned about Zimmerman. He says that Zimmerman was honest about having written the heretical book (but conveniently forgot that he only did so after he was caught), even though he had everything to lose. Zimmerman had seen a beacon of light in Pennsylvania and committed to taking his family there. It was sad that he hadn't made it himself, but Groban sees it as a triumph for his ideas that his family did. Walking in his ancestor's footsteps has obviously been a special experience for Groban. His ancestor has gone from being a name on a page (one he only just found out about, no less) to someone he learned about as a person. Because Groban himself is a musician, he particularly identifies with the fact that Zimmerman taught music "with great care" (gotta love those translations), but also appreciates that Zimmerman studied math and became a scholar and someone great. He of course ties this into his own beliefs that education is important. He appreciates the opportunities that he has had and is glad he is able to offer opportunities to young people. I'm kind of surprised that Ancestry.com is still airing the commercial where the woman says she found her grandfather's World War I draft registration but the image displayed is from World War II. Personally, I think it makes them look unprofessional. Would it be that difficult to edit it? And of course, since I mentioned in my post about the Julie Chen episode that I found Long Island Medium questionable looking, when I tuned in to TLC to watch this episode, what were they talking about on Long Island Medium, which was just ending? Genealogy! Apparently they're getting into family history also! The teasers had said we would go to rural China and learn about danger, courage, and a reversal of fortune. Julie Chen was chosen as the celebrity to lead off the new season. She is known as a television host, producer, reporter, and news anchor. I recognize her as being one of the hosts of The Talk (even though I've never watched it), but apparently she is better known for Big Brother. She is married to Les Moonves, the president of CBS, and has a five-year-old son, Charlie. Chen's parents are Yen Chun Chen (father) and Yuan Ling Liao (mother). Her father was born in Beijing and came to the United States as a graduate student. Her mother came officially for graduate studies but really was following her father, as the two had fallen in love as teenagers. Chen was born in Bayside, Queens, where her family had a "very modest" household. Her first language was Mandarin, which made me think of my grandmother, whose first language was Yiddish; her parents were also immigrants, and she didn't learn English until she started going to school. Chen's family was the only Chinese one in the "melting pot" of a community. Chen grew up knowing her father's parents, who lived with her family throughout the years, so is more interested in learning about her mother's side. She knows very little about her maternal grandfather, who died before she was born. His name was Lou Gaw Tong, and he had a rags-to-riches story. He started off as a stock boy with no formal education and went on to own his own grocery stores, and then invested in a shipping company. He indulged in anything and everything. He had many wives, and many children. She doesn't feel any emotional attachment to him because she never knew him. When Charlie was born, Chen's interest in her Chinese heritage was revived. It seems that at least part of the reason she wants to learn more about her grandfather is to be able to share that information with her son. Chen has reached out to her mother and sister, Vicky, for whatever information they might know. Vicky sends her a message through Ancestry.com (I think that ranks as one of the earliest appearances, doesn't it?) and directs her to look at the Lou family tree she has created. (I wonder if Mom and Vicky were really the ones who set it up.) It shows Lou Gaw Tong died February 10, 1960 in Singapore but doesn't have a birth date. He is shown with six wives (Chen's grandmother, Lwee Tan, was apparently the first wife), one of whom doesn't even have a name listed. (The Wikipedia page about Chen, by the way, says Lou had nine wives!) Vicky has also attached a document, which turns out to be a short obituary for Lou from the Straits Times, dated February 12, 1960. 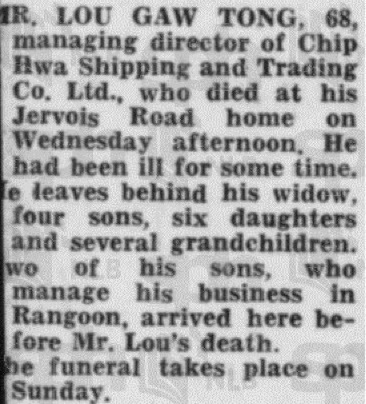 The obit mentions the Chip Hwa Shipping and Trading Co. and says that Lou had been ill for some time. He left a widow (only one? what happened to the other wives? ), four sons, six daughters, and several grandchildren. It also says he was 68 when he died, so we can approximate a birth year of 1892, even if Vicky didn't put that on the tree. You see this coming, right? Since Singapore is the only place mentioned in the obituary, that's where we're going—or as Chen says, "Singapore, here I come!" She has a lot of questions about Lou's life, like when he was born (so apparently she can't subtract either). Since he died in Singapore, she "hopes" there's something there. Our next scenes are of Chen riding in a car through the streets of Singapore. She goes to the National Library Building, Lee Kong Chian Reference Library, where she meets Jason Lim, a "historian" at the University of Wollongong. Lim is actually a Ph.D., listed as a senior lecturer in the School of Humanities and Social Inquiry. The library is known for its large newspaper collection, which makes it a logical place to look for more newspaper coverage about Lou's death. Chen asks Lim about the paucity of information in the Straits Times obituary, and he points out that the Times is the English-language newspaper. To find more information about a Chinese person, they'll need to look at a Chinese-language paper (I make a similar point when I teach about using newspapers for genealogy research). Lim has Chen look up a newspaper in the library catalog, for some reason choosing the same date as the Times obituary, February 12, 1960 (gee, maybe he found something already). Lim says the name of the paper, but I could not understand it. They retrieve a reel of microfilm and sit down at a reader. Lim scrolls forward to February 12. Chen admits she can't read or write Chinese and asks Lim if he can read the newspaper and translate it for her. This newspaper has a more detailed obituary for Lou: He came from Fujian Province, Anxi County, Penglai village, was schooled in a Confucian household, and had an "improper childhood", which prompts some discussion. Chen asks if that means Lou's education was not formal, or maybe he came from a broken home. Lim says he doesn't know, because there's nothing else about his childhood in the obituary. He continues reading and says that Lou went to Rangoon, Burma, but the obit doesn't say when. After World War II he went to Singapore, where he was involved in community work and philanthropy. He was a member of the Singapore Ankway (the Hokkien pronunciation of Anxi) Association, a group in Singapore for people originally from Anxi County (similar to a landsmanshaft). Chen notices there are lots of holes in the story of Lou's life. She asks Lim about more information, but he says that's all the obituary has. They talk about the association, which still exists in Singapore, and whether it might have records about Lou, so we know the next destination. In the outro to the segment Chen says it's going to be hard to track her grandfather back to his early years, but she's going to try (oh, please!). At the Ankway Association, Dr. Andres Rodriguez of the University of Sydney (which happens to be a city I used to live in!) greets Chen as she walks toward the door. (As an aside, even though this seems to be presented as happening right after the library, Chen is wearing a different dress.) Rodriguez tells Chen that most of the records of the association have been lost, but that he had some online hits when searching for information about Lou. He has a copy of an article from a Chinese academic journal. After letting it sit there for a few seconds, he pulls out an English translation, and we learn the title of the article is "Anxi Overseas Chinese: During the War of Resistance", by Chen Kezhan. (I think the journal name is Fu Jian Dang Shi Yue Kan.) The war began in 1937 for the Chinese. The people of Anxi hated the enemy Japanese because of the atrocities they committed when they invaded. In October 1938 Lou Gaw Tong was the Rangoon representative for the Southeast Asia Overseas Organization for Giving Relief to Refugees. He would have been reponsible for relief logistics and organizing propaganda to alert people to danger, an important position. Later during the war, the Japanese moved further into southeast Asia, which affected the Chinese people in those countries. In the spring of 1942 the Japanese moved into Burma. Lou took his family back to China for safety; Chen's mother remembers when they had to flee. Rodriguez comments that they couldn't stay and that "obviously" Lou would have had a price on his head. Rodriguez says Lou was the public face of the organization and would have been recognizable. In 1943, Lou was still working with the resistance and went to Shaoguan, meeting a shipment of carbines and ammunition that had come from America. He took it into Japanese occupied territory—Jianxi, Zhejiang, and Anhui—and to the Jiangsu front to give to the resistance army. This was very risky but showed that Lou was resourceful and dedicated. A sentence that was not completely shown said that Lou helped support funds of the resistance fighters. Chen asks about Lou's early childhood. Rodriguez found a book about notable overseas Chinese. Again we see the Chinese version, and then he brings out the translation. It says that Lou was from Anxi, Penglai town, and that at the age of 18 (roughly 1920) he went to Burma to work in a general store. He and his younger brother donated money to the town of Penglai to build the Anshan School. Chen is still hung up about Lou's "improper" childhood and asks if Rodriguez has any suggestions on how she can find out about it. He says she should go to Lou's home town, so now we have "Penglai, here we come." Chen comments on the newfound respect she has for her grandfather. In Penglai, Chen is driven to the Anshan School. She thinks it will be run-down and is very surprised to see a large, modern, well maintained building. She meets the vice principal, Li Ju Yuan, and an interpreter (whom she incorrectly calls a translator), Meiling Wu (a professor of Chinese language at California State University, East Bay). At the entrance to the school is a plaque which has the names of Lou Gaw Tong and his brother, Lou Jinzi, who in 1937 gave money to have this primary school built. The trio walk into the school courtyard, where many children are playing. Li tells Chen that the school has 856 students. Chen talks to the students in Mandarin and asks several how old they are. Everyone then goes into a classroom on the second floor, where a photograph of Lou Gaw Tong is hanging on the wall. Chen asks the students if they know who the man in the photograph is, and they all respond (almost in unison) that it is Lou Gaw Tong. Chen tells them he was her grandfather. The three women leave the classroom and go to an office. Chen asks if there is any more information about her grandfather. She learns the school plans to publish a book about the history of the school. It includes an entry from the Anxi County Gazetteer that says that Lou returned to Rangoon in the 5th year of the Republican era (1916). He went to sell rice, and later paid to have a new home built in his village. In the fall of 1937 (the 26th year of the Republican era) he gave money to build the Anshan School. He carried on his father's desire to strengthen the village through education. (The article also had something about a Penglai clinic, but the rest of the sentence was not shown on screen.) At the mention of Lou's father, Chen asks if his name is included. As a very odd non sequitur, the response is that the house is still standing. I don't know if that was due to poor editing or something else. Chen has found more than she expected to. She's becoming very proud of her grandfather (but what about all those wives?). She really likes that he wanted education to empower people. Ke has a photograph of Lou Gaw Tong in her ancestor shrine, alongside photos of others in the Lou clan, mostly cousins and uncles. Ke introduces Chen to her grandfather while Chen burns incense and prays at the shrine. After sitting down for tea, Chen asks if Ke knows about her great-grandfather. He was a government official, and a record on the wall has his name. The plaque has the name Lou Rulin and is an announcement of his position. 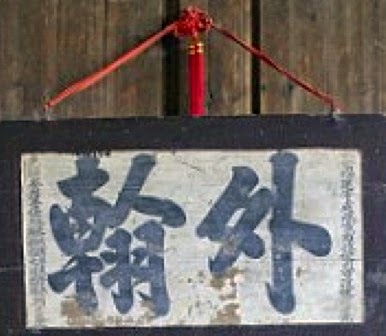 An imperial decree for Fujian Province in 1903 named him as a school official in the Confucius Academy of Yongchun Province. He was also an Administrator of the Imperial Examination in Dehua Datian County, which meant he gave exams to regional scholars; those who passed would be able to go to the top schools. It was somewhat like being the head of the Department of Education. It is apparent that education was important in the Lou family. It also sounds as though Lou Gaw Tong had a privileged childhood, rather than anything "improper." Chen asks for more information, but Ke doesn't know anything else. Chen wonders where she might be able to find out more about her great-grandfather. Wu says that there might be something at the Anxi County records office. Wu says she will go there first, then let Chen know if she finds anything. And Ke suggests that they can visit Lou Rulin's grave. Chen muses about how it's looking as though her grandfather didn't have a rags-to-riches story but actually had a privileged upbringing. His father was obviously highly educated. Lou Gaw Tong was able to succeed in business because he knew how to use his brains. But this is causing more confusion about the improper childhood comment from the obituary. Chen begins to come up with scenarios: Was Lou abandoned? Was her great-grandfather a selfish scholar not interested in being a family man? Chen goes to the Anxi County records office, where Wu has found some information. Wu has a copy of the Anxi Gazetteer (maybe the same edition that supplied the information learned at the school? ), which has information about historical events in the county. There is an article on Lou Gaw Tong. He was the second youngest of seven brothers (which I guess makes Lou Jinzi the youngest). Lou Rulin, his father, was a Qing official who was appointed by the emperor, which means he had power and money. Then we learn that the imperial examination was abolished, and Lou Rulin didn't seek a new appointment, but instead went home. (Maybe he was a family man!) The family lost its income and prestige. Chen asks why Lou Rulin wouldn't have tried to get a new position. Wu explains that he would not have had many options to take up a new career. His whole life had been spent in serious study for a career as a scholar. With the abolishment of the examination and the loss of Lou Rulin's position, the family would have declined in status. Wu continues to read from the gazetteer. Lou Gaw Tong lost his father when he was young. Chen asks Wu to clarify whether that means that Lou Rulin died, as opposed to abandoning his family. With the loss of income and the death of his father, Lou Gaw Tong went to Xiamen at the age of 13 to work as a shop laborer and was not able to go to school. (So Lou Rulin must have died about 1904–1905, not long after he received that imperial appointment. The examination must have been abolished pretty soon after the appointment occurred. Did Lou Rulin die of natural causes?) So we finally learn what the "improper" childhood was, and Lou Gaw Tong's success really was a rags-to-riches story after all. The closing segment is a visit to Lou Rulin's grave. Chen meets up with Ke, and several more-distant relatives are there also. Another person in attendance is Huihan Lie, an expert in Chinese genealogy, who functions as the interpreter. The group sets off on a hike up a hill or mountain. After a steady climb, they arrive at a tombstone sitting by itself. Lie translates the Chinese characters on the stone: "Our esteemed father from the Qing dynasty, scholar official, Cloudy Mountain." 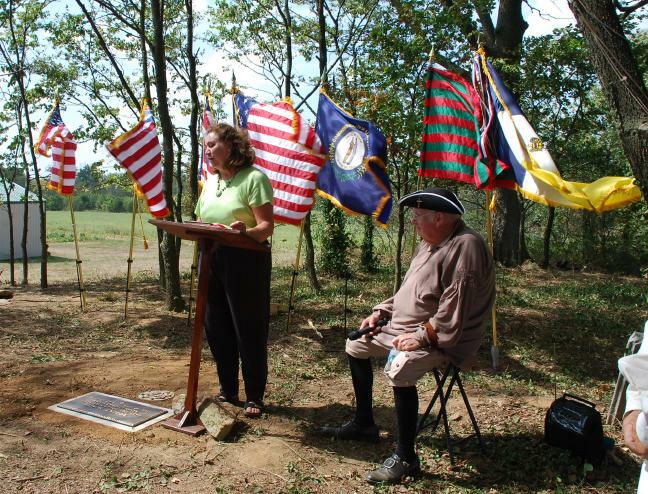 He says that Cloudy Mountain is Lou Rulin's name on the tombstone and explains that it is an unofficial honorific name, intended to indicate that Lou Rulin was well educated and had elevated knowledge. Chen asks whether this is a special place to be buried. Lie says that it would have been specially chosen, as the height and location both indicate the status of the individual. Ke and the other relatives have brought offerings for Lou Rulin. There are papers and money, to give him wealth in the afterlife. 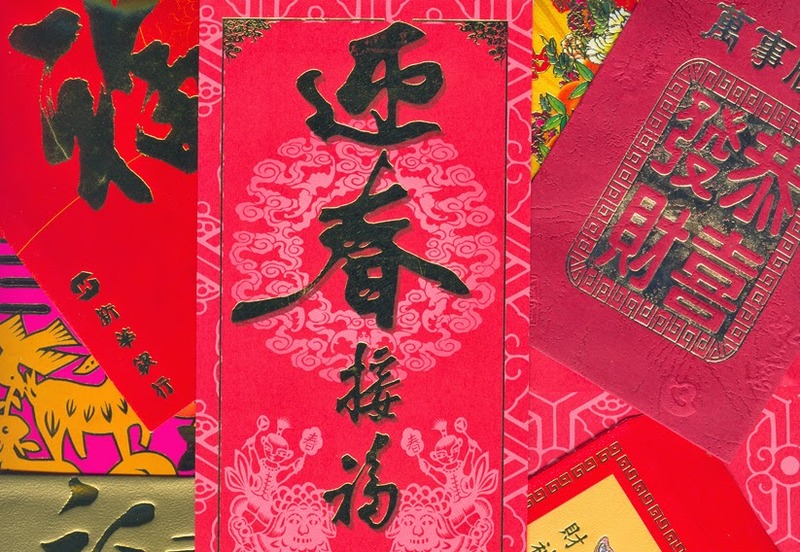 The papers have symbols for happiness, respect, and good wishes. After spreading them around in front of the gravestone, the money is burnt to send to Lou Rulin. While the money is burning, Ke introduces Chen to Lou Rulin. Chen feels the privilege of being on the mountain. She knows it's a special moment and looks forward to taking her memories back to her family. She has decided that she has an amazing family history. She thinks of herself as a spiritual person and feels that her ancestors protect her and look over her. In the final segment, Chen talks about how fulfilled she feels now that she knows her family members had a bigger role in history than she had given them credit for. She feels more connected to her Chinese heritage. This is evidenced particularly by her next comment: that people are destined for who they become, predetermined by their ancestors. She has a better understanding now of who she is and why she is that way, and even understands her parents better. Over time she plans to incorporate her heritage and culture into her daily life with her son, for both of them. I understand why they focused on the stories of Lou Gaw Tong and Lou Rulin, because they were very interesting. But for all the interest Chen showed in her grandfather's wives at the beginning, I was a little surprised that nothing else was mentioned about them for the rest of the episode. On the other hand, I know Chinese culture is very patriarchal, and it's possible that the researchers weren't able to find much information about those other wives. But I was really hoping they would give "Unknown" a name. Now that the new season has started, more Ancestry ads are being shown than normal. The one that currently annoys me has a woman talking about how she didn't think she'd find much past her grandparents. She had a twitching leaf that pointed her to a document about her grandfather and then talked about how the next spastic leaf led her to "another member's tree", which had her great-grandparents, and their parents. (This is a long version of the ad.) That one bothers me because she blindly accepts that the information in this other person's tree must be accurate and doesn't even comment about any documentation that the tree has. Yes, I know, that is how most people use Ancestry. But it doesn't mean I have to like it. Oh yeah—and she says she finds her grandfather's World War I draft registration, but what you see on screen is a World War II registration for the Old Man's draft. Pretty sloppy, Ancestry. Honey Boo-Boo isn't on TLC anymore, so I thought I would be safe from commercials for frightening shows. Wrong! Long Island Medium looks like a classic con woman, and she sounds like a harridan. Why do people watch these programs?